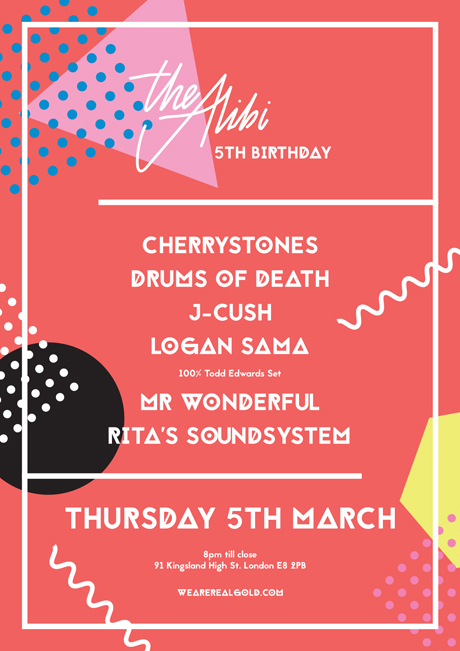 Our beloved basement bar The Alibi is 5 years old on Thursday 5th March. We can’t believe we made it this long! Drinks courtesy of Jameson Irish Whiskey & Kopparberg. Entry is FREE (as it always has been), just click attending or write names on the event wall here. Poster designed by James Kirkup / Studio Beuro. Cherrystones. Drums of Death. J-Cush. James Kirkup. Logan Sama. Mr Wonderful. RGEVENT. Rita's.